It is very important, for those of you DARING Do It Yourselfers out there who are going to attempt to paint a mural on your own, to properly PLAN first before you start. The following videos will give you more insight on what you will need while preparing to paint a mural in a baby nursery. The first video will bring you through the list of specific painting materials that you will need before you start. The second video walks you through the types of paint you will want to work with. Do It Yourself! Painting a Tree Mural is Easier Than You Think! Well, I would like to walk you through the process of how to paint a simple tree mural. My client wanted something very basic to go along with her brown and blue nursery decor for her twin boys (who are do any day now). She showed me a picture of a tree silhouette that she liked, but she wanted me to use 3 shades of brown to add some shadowing and highlighting. She also wanted to hang letters (the boys names) from the tree branches above the cribs. We picked the colors from a Benjamin Moore color chart that I had. The colors tie in with the crib bedding nicely. Before my client moved the cribs away from the wall that I would be painting, I asked her to draw some reference lines of exactly the placement of those cribs so that way I could make the tree fit perfectly over both cribs. I started the job, by using white chalk to hand draw the outline onto the wall making sure the branches reached out far enough over the cribs. If you are not confident enough to hand draw the tree outline, then you can also print out a tree outline onto acetate and then use a projector to project the image onto the wall. This is great if you have trouble with keeping the correct dimensions. I then got my 3 paint colors ready (I used latex paint) and painted the edges with the darkest brown, the medium in the center areas and then highlighted with the lighter brown. A trick to keep the paint movable on your brush is to use a matte medium which is available in any craft supply store that sells acrylic paints. It is really pretty simple once you have the outline done. It is almost like coloring in a coloring book. All you have to do is fill in the outline with your paint. The complicated part is knowing where to add shadow and highlights with your paint. Always be aware of your light source for highlighting with a lighter color. My imaginary light source was coming from on top, so I used my lighter color on the tops of the branches and leaves. Once the job was complete and nearly dry, I took a damp paper towel and touched the areas where the white chalk with showing on the edges. My client was very happy with the outcome. They moved the cribs back the next day and I was able to come back and take a few pictures. This job only took me a few hours to do from start to finish. So, what do you think? Do you think you can paint something like this? I think you can! Painting a silhouette of a tree is often times easier than painting a more realistic looking tree. An easy trick to doing this is using an overhead projector. You can print out a tree outline on clear acetate paper or even just draw the outline on the paper and then project it right onto the wall. You would then outline it in pencil and then paint it in. This can be done in almost any color from dark more vibrant colors to light more pastel colors. If you are not sure about colors, practice a bit on foam board first before attempting the actual mural on the wall. Here are a few options for silhouette tree murals in the nursery. Here is an option for a tree silhouette stencil by Wallstory Murals. Check out their how to post HERE. This is definitely one of my favorites. I love how they incorporate the shelves to look as if they are actual branches. So creative. Another option is to paint the silhouette of the tree in one color. I love how they did this with a darker color on a lighter color blue. This mural is actually one that I personally did a few years ago. I finally get to showcase something of my own! LOL Anyway, I used 3 different colors in this mural – brown for the tree trunk, and 2 contrasting greens for the leaves. So, if you are looking to paint a tree in your baby’s nursery, then go with a simple silhouette design. The overhead projector trick is really great for anyone that does not have painting skills, but yet still has a steady hand. It is just like painting inside the line in a coloring book. I recently came across a person who had asked a question on a forum about how to paint large circles on their wals. So I would like to give you a few simple steps to accomplish the above modern circular pattern. Step 1 – Choose colors. In this case, the colors were taken from the bedding – beige, light pink, dark pink, and brown. Step 2 – Base coat your walls. They used the neutral beige as their base color in the above nursery. Step 3 – Prepare your circle making tool. Tie a string around a pencil and attach a push pin at the other end of the string. However long your string is, will determine how big your circle is. You can use different length strings to get different sized circles. Step 4 – Outline the circles on the wall. Stick your pin into the wall. Keep the string tout and draw your pencil line around the tack. Step 5 – Paint the circles. If you are going to paint your circles and also outline them in different colors (as they did in the picture above) then start with the inside circle color first. You will then paint the outline last. 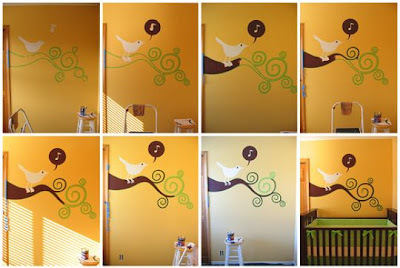 So, this is an easy way to add a simple mural design to the walls of any child’s room. This technique can be used in both boys or girls rooms. As long as you now know the trick to painting circles – you can be as creative as you want to be! There they go through the whole step by step process starting from the planning to the actual painting. It shows how easy it is to try painting a simple mural on your own. What better feeling then to walk in your baby’s nursery and be proud of the job that you did. You can take pride in your work knowing that it was a labor of love for your child. A great place to find inspiration is to search on different photo sites and look for images that you like and that might be easy enough to paint. Even if it is just an outline like this tree limb and bird mural. It doesn’t need to be anything elaborate. Today’s nursery trends are actually going more simplistic with bolder colors and less fu-fu (if ya know what I mean). If you need ideas, please feel free to email me. I would be happy to help you. I am all for helping moms and dads who want to do it themselves!